A little over a year ago I sampled something called queso fundido at the home of my friend...and fellow chef...Nancy. Since Nancy's food is unfailingly delicious I always look forward to gathering around her table. But beyond that, Nancy has a wide experience of ethnic foods that I lack. Frequently she will serve something that I have never heard of, much less tasted. This simple and fantastic little dish of melted cheese was one of those things. 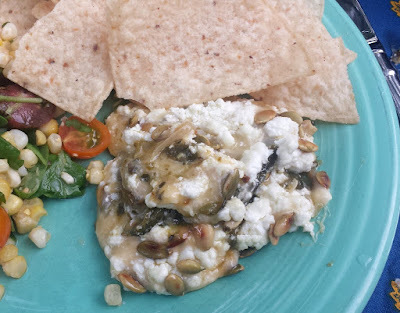 Many people, myself included, have had Nachos—a sort of dumbed-down, processed food variation of classic Mexican queso fundido. But the dish I had on that particular evening was definitely not an ordinary platter of Nachos. When Nancy stepped out onto her patio that evening with a piping hot cast iron skillet filled with sizzling cheeses (a nice Monterey Jack and some creamy Goat cheese) and freshly made rajas (strips of onions and roasted poblano peppers with garlic and oregano), studded with crunchy, toasted pepitas, I knew I was looking at something special. It did not disappoint. I could have made a meal out of it, but I knew there was more deliciousness to come (Salmon with a tomato and green olive relish, if I recall correctly), so I held back. But I had to have the recipe. Luckily for all of you, Nancy graciously shared it with me. I have since discovered that queso fundido is not as unknown to most Americans as it was to me. Many, many recipes are available on line. 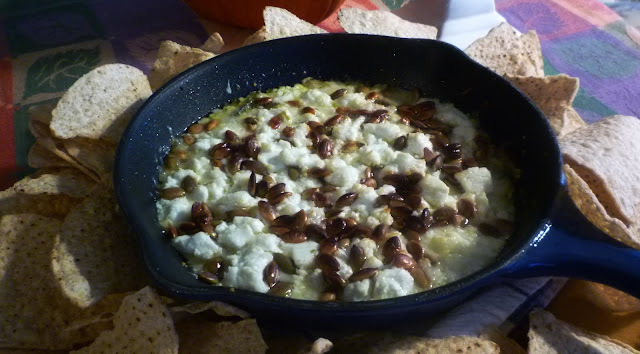 Nancy's recipe is unusual, first and foremost because of her inclusion of goat cheese. Most recipes use one (or more) of several good melting cheeses: Monterey Jack, mild Cheddar, Wisconsin Brick, Chihuahua, Asadero, etc. 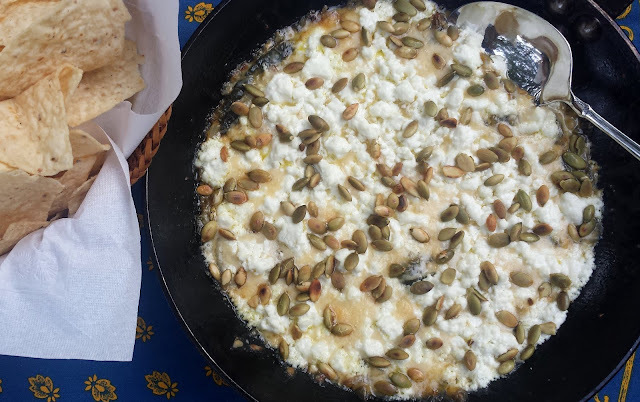 But the inclusion of goat cheese into the mix adds a fantastic tang...and also cuts down on what I consider to be the objectionable oily-ness and stretchiness that melted cheeses can sometimes have. Her other unusual addition is the final topping of toasted pepitas. They add great flavor and wonderful texture and the dish wouldn't be the same without them. The rajas are a fairly standard addition. Nancy's recipe for them follows a Rick Bayless recipe fairly closely. 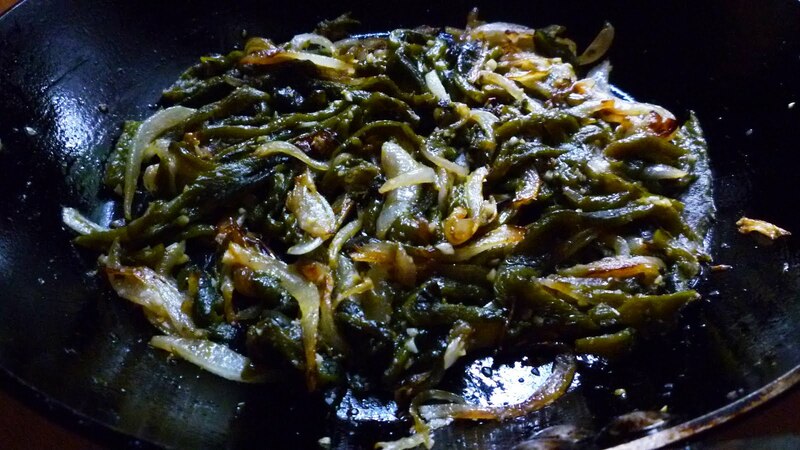 He calls this sautéed mixture of onions and roasted poblanos an essential element of Mexican food and cooking—something that can be used as a filling for tacos, an addition to soups/stews, an accompaniment for grilled meats, a filling for cheese quesadillas, etc. They are wonderful in the queso fundido, and they are frankly the reason that I suddenly started thinking about this dish again, one year later. There are of course a lot of other delicious things to do with poblanos, but a couple of weeks ago when I noticed that fresh poblanos were abundant at my farmers' market, this was this dish I wanted to make. The weather is cooling down...and a dish of hot cheese seemed like a pretty fine idea. Since peppers freeze well in their roasted form, I bought more than I needed so I would have them handy throughout the fall and winter months when queso fundido would be the perfect addition to a family game night...or a Sunday afternoon football party...or even for a simple evening meal. 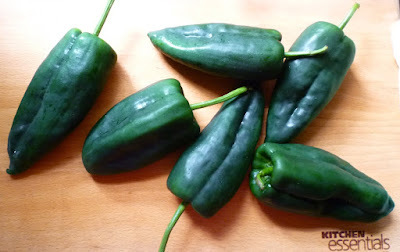 If you have never prepared roasted poblanos, follow the method I outline for roasting and peeling bell peppers on my red pepper and potato pizza post from a few years ago. If you have access to plastic gloves, it might be a good idea to wear them when you're peeling and seeding the peppers. 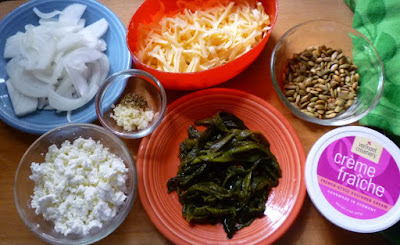 Poblanos are sort of mild to medium hot and if you handle enough of them, your hands will definitely feel it. If you don't have gloves, wash your hands well with soap and water after working with the peppers and before doing anything else. 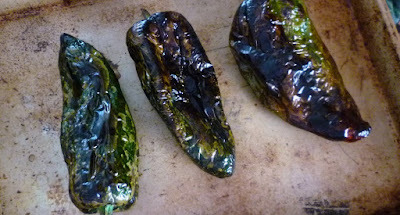 And, while on the subject of heat, definitely sample your roasted poblanos before you use them in your recipe so you will know if they happen to be extra hot. I purchased an extra fiery batch of them last year. I knew they were hot and still made my queso fundido with the full amount. It was delicious, but would not have been acceptable to anyone who is sensitive to heat. If the ones you buy are super hot, you might consider cutting back on the quantity that you add. To freeze your roasted peppers, simply lay the roasted and peeled peppers flat, stacking them and laying a piece of plastic wrap in between each pepper. Slide the stack of peppers into a Ziplock bag, press out the air and lay the bag on a flat surface until the peppers are frozen hard. By separating each of the peppers in this way, you will be able take out as few or as many as you like when you want to thaw them. Every time I have made queso fundido I have served it exactly as Nancy did...with a big pile of crunchy tortilla chips. I like it this way whether I'm eating it as a shared appetizer...or for dinner with a green salad. But it also makes a wonderful filling for soft tortillas...or a topping for toast (sort of an open faced and very savory grilled cheese sandwich). However you decide to serve it, be sure to make more than you think you and your friends will eat, as it is addictively delicious. Rub the poblanos with olive oil and place on a baking sheet. Broil the peppers, turning as the skin chars, until they are blackened and blistered all over. Set aside to cool. When cool enough to handle, remove and discard the blackened skin, the stems and cores, white ribs, and seeds. (Use gloves if you hands are sensitive to the heat of chiles.) Cut into 1/4-inch strips and set aside. In a heavy oven proof skillet (cast iron is perfect) with a 10-inch cooking surface (see note), heat the oil over moderate heat. Add the onions along with a pinch of salt and cook until soft and beginning to caramelize—about 5 to 10 minutes. Add the garlic and oregano and cook just until fragrant (less than a minute). Add the poblanos, tossing to coat in the onion/garlic mixture. Heat through and season to taste with salt & pepper. If you are working ahead for a party, you may stop at this point and set the mixture aside at room temperature for a couple of hours. If you are working further ahead than that, scrape the mixture into a container and chill. Return to the pan and heat through before continuing. Add the cream to the hot rajas and bring to a simmer (this will happen almost immediately). Remove from the heat and scatter the Monterey Jack over all, followed by the goat cheese. Place the skillet under the broiler (set on high) and broil until the jack cheese is melted, the goat is beginning to be tinged with gold and the cheese is bubbling at the edges. Sprinkle with the pepitas and serve immediately with tortilla chips or warm soft tortillas. Serves 4 to 8 (depending on appetites and other items being served). Toast the pepitas in a dry skillet set over medium high heat. Cook, tossing and stirring constantly until the pepitas are browned in spots and slightly puffed. Transfer to a cool plate. 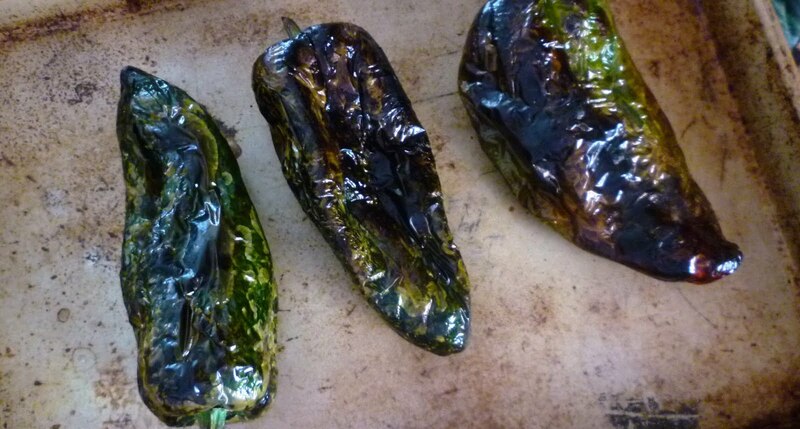 If you have roasted poblanos in your freezer (and don't know their original fresh weight), weigh out about 7 oz. of the roasted peppers for this recipe. A wide skillet (10-inch surface) is the best thing for this recipe. It keeps the layer of cheese thin so it will melt quickly and completely without becoming unpleasantly oily and stretchy. If you would like to make half a recipe, us a skillet with a 7-inch cooking surface. If you would like to make open faced sandwiches, toast slices of a sturdy artisanal loaf and spread on a baking sheet. Before adding any of the cheese, divide the creamy rajas over the bread slices and top with the cheeses. Broil until melted and bubbling. Scatter pepitas over and serve.